The Second Street Improvement Project will transform the Second Street corridor into a pedestrian- and bicycle-friendly Complete Street. The proposed project will add 15-foot sidewalks and new curbside, median-protected cycle tracks on each side of the street. The travel lanes along the corridor would generally be reduced from two lanes in each direction to one. CHS Consulting Group prepared a Transportation Impact Study for this project, to include impact analyses for traffic at 29 intersections, transit, pedestrians, bicycles, parking, loading, emergency access, and impacts from construction. Due to the reduction from four to two lanes along Second Street, and left-turn prohibition at most intersections, the project requires extensive diversion of existing traffic to the Bay Bridge. CHS developed a detailed methodology for traffic diversion, and analyzed potential impacts on Muni bus travel times along the corridor. The scope of work includes analysis of transportation impacts for the existing year (2013) and future year (2040) with and without the project scenarios, and with one variant project scenario. 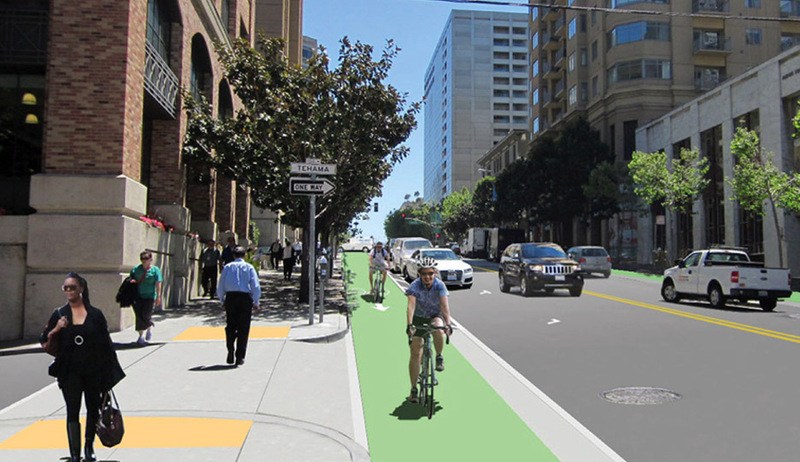 The project is a joint undertaking of SFMTA, SFDPW, and the San Francisco Planning Department, with a portion of the work to be performed by SFMTA staff. Challenges include coordination among stakeholder agencies, a fast-track schedule, and expedited review and delivery.